Ok, I realize that Yong Zhao may not want to be nominated for Secretary of Education. Also, as you may have heard, we already have a new Secretary of Education. But I wish I could wave a magic wand and, with the help of a little fairy dust, see him firmly ensconced in that role for the next few years. Who is Yong Zhao? He is a Foundation Distinguished Professor in the School of Education at the University of Kansas. He’s also the inspiring author of “World Class Learners,” a book I’m currently reading. He advises us to look toward those countries that have been down the road of standardized, national curricula and learn from their experience. 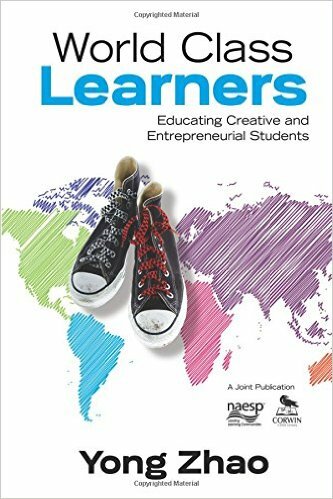 Countries like China, Korea, Singapore and Hong Kong are now moving toward embracing more creativity in their schools. While teaching in Singapore, I heard many people remarking on the lack of creativity in their students. One evening I took my students to the live taping of “Asia’s Got Talent” at Marina Bay Sands, and a Singaporean friend warned me before the show that I wouldn’t see any contestants from Singapore. “How’s that possible?” I asked. “It’s being filmed in Singapore.” He said Singapore grows mathematicians, not artists. And he was right. Not one contestant was from Singapore. There were artists, musicians, actors and odd performers from every other nearby country, but not one local contestant. And I agree with his basic philosophy of the purpose of education: “The most desirable education, of course, is one that enhances human curiosity and creativity, encourages risk taking, and cultivates the entrepreneurial spirit in the context of globalization.” That’s what our students will need to navigate their uncertain futures. Also, I’ve heard Yong Zhao speak, and he’s hilarious. I doubt the current Secretary of Education will ever make me laugh. Next Why is Global Education Important?